The I/O (Input / Output) tab enables you to setup the audio input and output. Enable this to be able to choose the Input and output in the main LUCI Studio program. Choose the input you want to use from the drop-down menu. Choose the output you want to use from the drop-down menu. Force the output to be mono always, even when a stereo stream arrives. Choose the sample-rate for the input and output you want to use. This will set the sample-rate on the Audio I/O card. 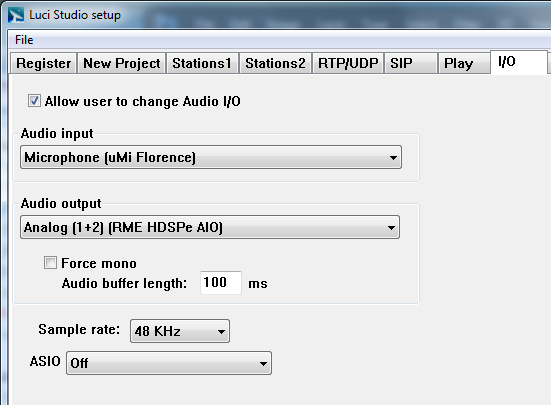 If you have a sound-card with ASIO driver you can choose it here.